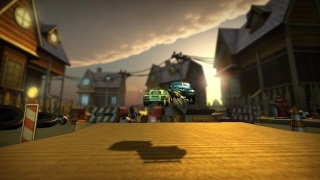 Super Toy Cars is a racing title that was developed by the indie studio eclipse Games! The game takes many cues from both Micro Machines and the Mario Kart series, but does it live up to the high standards that those two long-running franchises have set? Keep reading to find out! First off the game has several game modes, including career mode, quick race, and multiplayer to play against some of your friends locally. There isn't any online multiplayer which is sort of disappointing, but it doesn't detract from the game all that much. The career mode will have you racing on tracks to try to earn credits so you can unlock new cars and courses and though it starts off easy it becomes very difficult after awhile! While quick race lets you quickly setup a race and is perfect for those who are pressed for time. The game also possesses a comprehensive track editor which is easily the best feature of the entire game as it adds an unlimited amount of content to the otherwise fairly light racing title! The game also features power-ups to obtain such as missiles and magic 8 balls which makes it feel somewhat similar to Mario Kart, however the game has several negatives as well such as tracks that feel too similar to one another and the campaign mode can often feel like a chore to complete which certainly affects our opinion of the game. The graphics in Super Toy Cars are impressive and look extremely nice for a downloadable title, however the tracks look uninspired and similar to one another in several cases. The soundtrack is quite good and fits the game, however as are the in-game sound effects which is good! The controls are a little awkward as the acceleration and brake buttons are mapped to the shoulder buttons and the in-game physics take some getting used to, but at least the controls aren't broken. The Off-TV Play on the other hand is nearly flawless which is a definite positive! 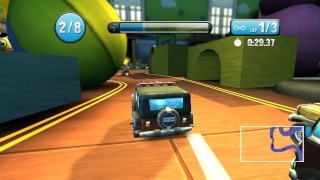 With gameplay that is for the most part solid, an excellent track editor, and impressive graphics Super Toy Cars certainly is a game worth considering for your Wii U games collection, however certain aspects of the game feel like a chore, while the levels feel uninspired and the controls can be quite awkward which really hurts the game's score. Bottom line Super Toy Cars had the potential to be an extremely good game, but poor design decisions have instead left the game as a decent title. 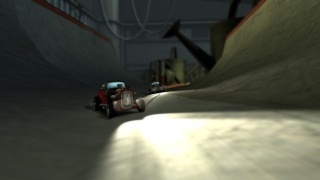 We still recommend this game to fans of the racing genre. Great review, but I'm still on the fence. I need to read a few more reviews before I consider downloading this game. The level editor is good and all, but the rest of the game is meh. The track editor is the only reason why I downloaded this game.